This owner’s dream day went down in flames in typically Italian character. Stored somewhere in the library of fantasies that are so good it’s hard not to wish for them to come true is one where a lucky, hardworking, and presumably deserving Ferrari owner takes his vintage F40 on a road trip to pick up a brand new and even more rare LaFerrari Aperta. All of these ingredients for the perfect day were in place, but unfortunately things took a turn for the worst when the rare Italian supercar caught fire en route to Maranello and burnt to a crisp. Italian news source IGV reports via GT Spirit that there is no apparent cause for the fire but cites FerrariChat when claiming that the F40 may have borne the chassis number ZFFGJ34B000074047, which would make it the 6th F40 prototype in existence. Not only would this be a loss of an artifact of Ferrari’s history, it would mean the demolition of a work that bears the mark of Enzo Ferrari himself, a rough draft of a car that defined a generation of supercars and kept Ferrari’s name on the map in a competitive era. If the proposed VIN is indeed the real number, this would also make the F40 Ferrari one of seven that was converted to GT spec by Italian engineering firm Michelotto and shown off at the 1987 Frankfurt Motor Show. Apparently the owner previously had a rare Lamborghini Muiria SV catch fire due to faulty spark plugs, proving that this collector is a veteran in the art of owning Italian supercars. 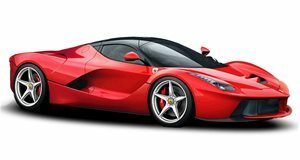 The owner, who GT Spirit claims is British billionaire Jon Hunt, previously drove a collection of rare Ferraris including a 288 GTO, F50, and Enzo over to pick up a LaFerrari, seems to have been en route to pick up of of the 209 LaFerrari Apertas in existence. Being in such good graces with Ferrari as to have been invited to buy two of the company’s most sought after models means that there is a slight chance the automaker will rebuild the car for him, though by the looks of the pictures, there isn’t much left to rebuild. Photos courtesy of IVG.